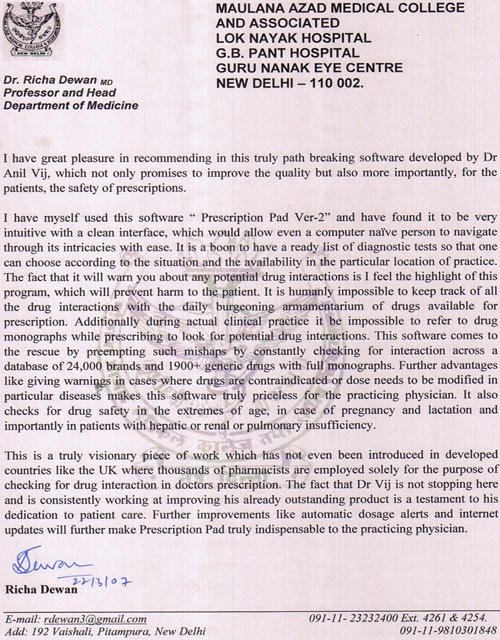 I have great pleasure in recommending in this truly path breaking software developed by Dr Anil Vij, which not only promises to improve the quality but also more importantly, for the patients. the safety of prescriptions. I have myself used this software "Prescription Pad Ver-2" and have found it to be very intuitive with a clean interface, which would allow even a computer naive person to navigate through its intricacies with ease. It is a boon to have a ready list of diagnostic tests so that one can choose according to the situation and the availability in the particular location of practice. The fact that it will warn you about any potential drug interactions is I feel the highlight of this program. which will prevent harm to the patient. It is humanly impossible to keep track of all the drug interactions with the daily burgeoning annamentarium of drugs available for prescription. Additionally during actual clinical practice it be impossible to refer to drug monographs while prescribing to look for potential drug interactions. This software comes to the rescue by preempting such mishaps by constantly checking for interaction across a database of 24,000 brands and 1900+ generic drugs with full monographs. Further advantages like giving warnings in cases where drugs are contraindicated or dose needs to be modified in particular disease makes this software truly priceless for the practicing physician. It also checks for drug safety in the extremes of age. in case of pregnancy and lactation and importantly in patients with hepatic or renal or pulmonary insufficiency. This is a truly visionary piece of work which has not even been introduced in developed countries like the UK where thousands of pharmacists are employed solely for the purpose of checking for drug interaction in doctors prescription. The fact that Dr. Vij is not stopping here and is consistently working at improving his already outstanding product is a testament to his dedication to patient care. Further improvements like automatic dosage alerts and Internet updates will further make Prescription Pad truly indispensable to the practicing physician.